In which G.M. Norton poses for pictorials. I’m tickled pink to be able to share with you some daguerreotypes of your humble protagonist from a recent photo shoot at the acclaimed Doll House Photography in Birmingham. As well as the honour of seeing Norton of Morton crowned the Best Vintage Fashion & Lifestyle Blog at the National Vintage Awards 2014, there was also a prize on offer – a free photo shoot at Doll House. Doll House specialise in pin-up and boudoir photography so you could be forgiven for thinking that not many chaps walk through the studio doors. As I discovered though, the very talented lady behind the lens, Chrissy Sparks, doesn't just take photos of ladies in lingerie. Oh no! In fact, she had recently welcomed a male stripping troupe to be photographed. Since relinquishing my lip weasel in the name of love, I thought the photo shoot would be an ideal opportunity to get some professionally-taken shots sans moustache. 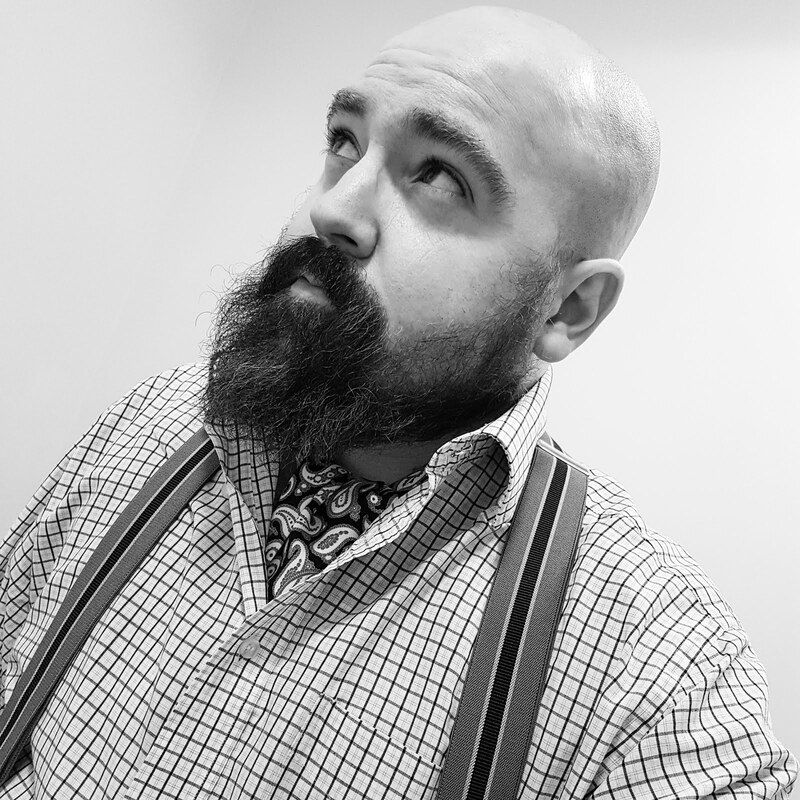 Dismissing the donning of corsets and suspender belts, I brought along some of my favourite items of gentlemanly apparel. I was keen for the pictorials to hark back to a bygone age, with a little of the film noir about them. I also wanted to capture a dash of humour too. I compiled a few photo ideas on Pinterest which I shared with Chrissy before the day of the photo shoot. Upon arriving at the photo studio in the heart of Birmingham’s renowned Jewellery Quarter, I was taken to a private changing area where I proceeded to unload all my worldly belongings that I'd brought along. 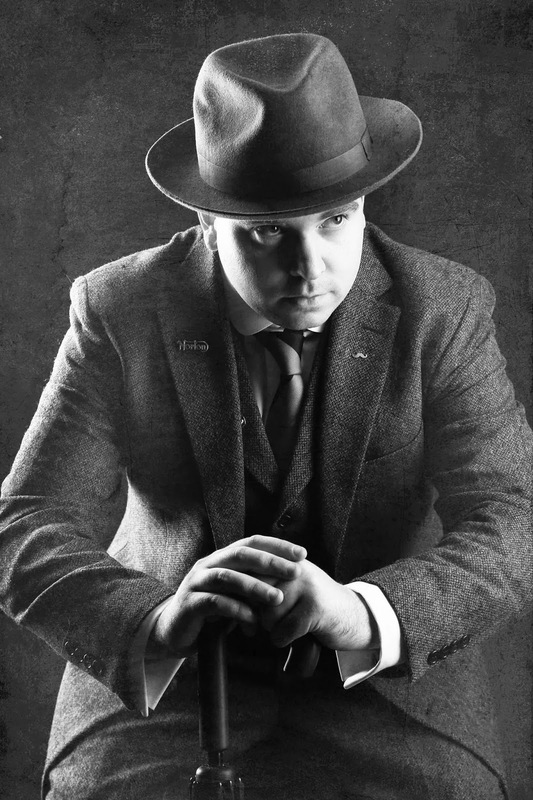 As you can see from the first pictorial below, my tweed suit and fedora soon came out, along with a detachable collar and tunic shirt from Darcy Clothing. The neckwear is a New Sheridan Club tie. Since making this my profile pictorial on the Twittering Device a few days ago, it’s been commented that it has a touch of The Third Man about it. 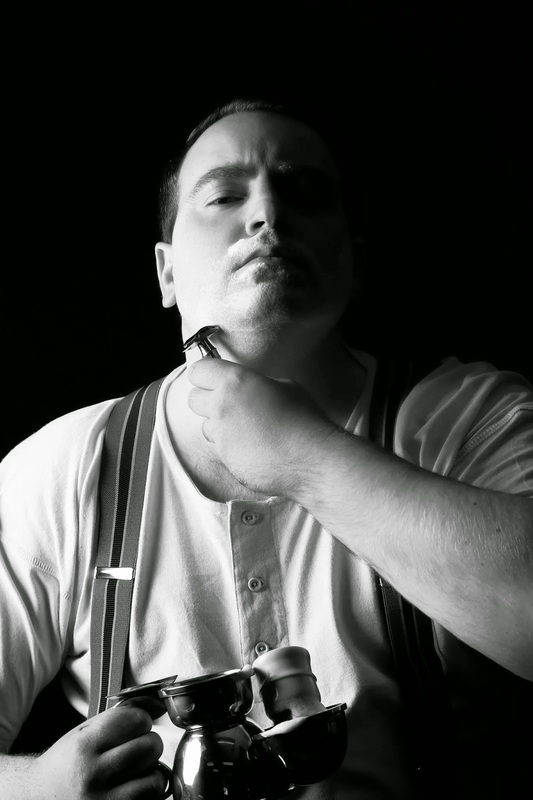 As a fan of wet shaving with a safety razor, I was also keen to capture this on camera. 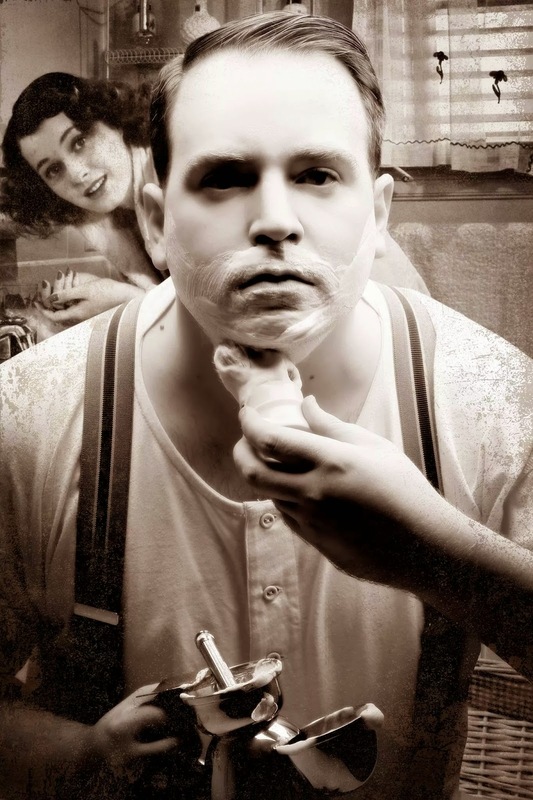 There’s not an overwhelming number of vintage shaving pictorials on the World Wide Webular. For these shots, I relieved myself of the tweed and stripped down to my three-button undershirt with my button-on braces. For those not sure what I'm holding, it's my pewter shaving mug. The second one is quite mean and moody. I adore the dark shadow running down one side of my face. I feel I must prepare your eyes for the final photograph as it contains a sight you probably never imagined being presented with - my knobbly knees. Having grown up on a visual diet of Carry On films and Boulting Brother directed escapades, I wanted a little silliness to shine through. 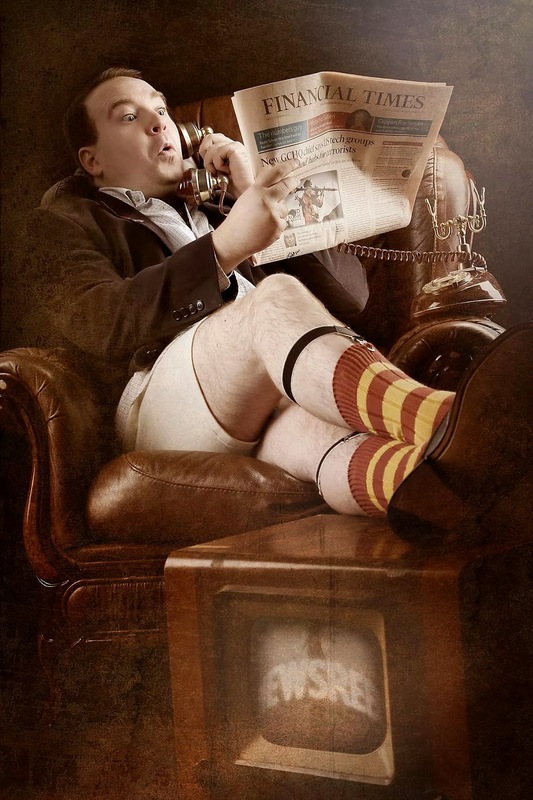 Nothing screams English gentleman more than sock suspenders, a sumptuous armchair and a copy of the Financial Times. 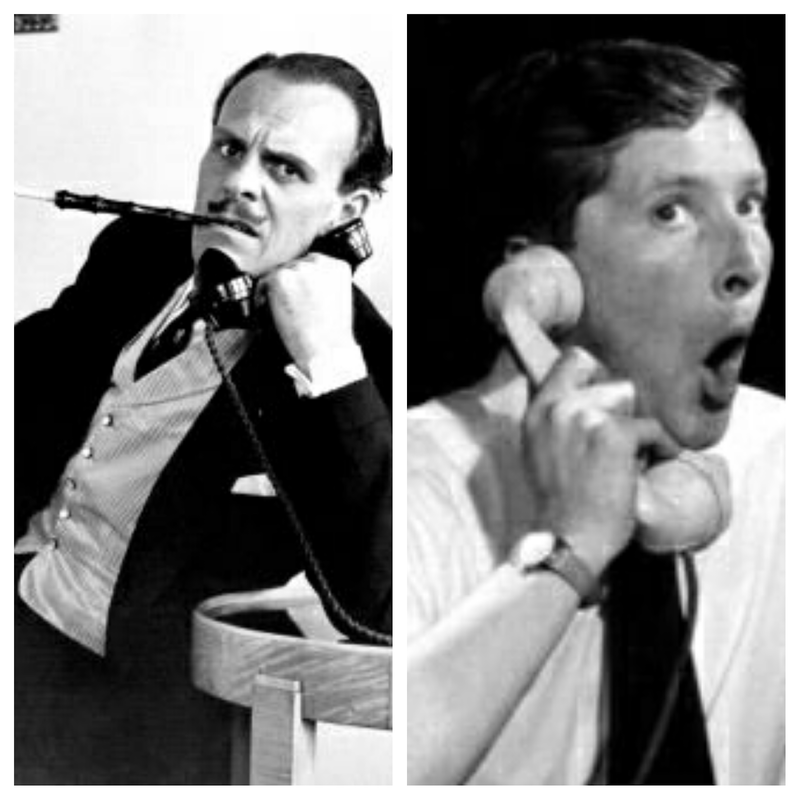 The facial expression reminds me of a mixture between Kenneth Williams and Terry-Thomas. I'm enormously grateful to Chrissy for taking the pictorials. It was a wonderful experience and something I would love to do again. Doll House Photography are on Facebook and Instagram - definitely worth a Like or Follow! Many thanks, dear Porcelina. It was a splendid experience! I plumped for the fawn/wine colour option. I'm wearing them at this very moment and have been very impressed. I was wondering whether to pay extra and get the Thurstons but decided to give Darcy a whirl.